The divine pairing is back for another season! 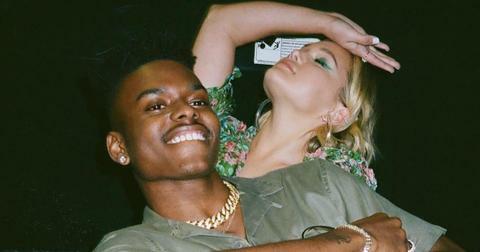 We certainly can’t get enough of Tyrone Johnson (played by Aubrey Joseph) and Tandy Bowen (played by Olivia Holt) in the Marvel series Cloak & Dagger. Last week the season premiere featured our two leads attempting to lead somewhat normal lives while struggling to cope with not using their respective powers. Of course, Tyrone can’t stay out of trouble and has to keep interfering in police business. In the season premiere, Ty comes across a mysterious mark known as a veve. With no knowledge of the voodoo symbol, he enlisted he ex-girlfriend Evita to help him understand what the mark could mean. The less than stellar reunion resulted in a very emotional scene between the two characters. And, the track that followed completely summed up the loneliness Cloak was feeling. What fans may be surprised to learn is the track, titled “Numb,” was written by Freeform star Aubrey Joseph. Yes, apparently the 21-year-old can not only can kick a-- on a hit series, but he also creates kicka-- music. Aubrey Joseph wrote the song specifically for Cloak & Dagger. While Tyrone is drawing the veve on the abandoned church floor, “Numb” plays in the background. According to Marvel, the actor wrote this song specifically for the show. He revealed to the outlet that executive producer and showrunner Joe Pokaski reached out to him during the first season to write a song for the series because he knew the actor rapped, sang, and wrote music. One day, his manager came to his house and presented the actor/singer with a beat by Dreamstate. Once he heard it, Aubrey recalled, "I was like, 'This is the one,' and we went to the studio that day. We wrote the song, wrote the hook first, and then I laid down the verses, and boom, that's how we got 'Numb.'" Is a song with co-star Olivia Holt in the future? Aubrey told Marvel.com that his song “Numb” fit perfectly into the emotional scene between his character and Evita. "The funny thing, which is is crazy that he [Pokaski] even caught it, was I wrote this song from Ty's perspective to Evita in the first verse, and then in the second, it was more so towards Tandy." He continued: “It was cool that he used it for that specific situation because it fits so well.” Aubrey was definitely excited to have his music featured in the popular Freeform series, saying, "It was so cool we finally got to put it in the show." Well, Aubrey is not the only star of the show who is also a musician. Co-lead Olivia had a track appear in the Season 1 finale. When asked if the divine pairing would ever create a song together, the Cloak & Dagger star revealed, “We should. Most definitely." Adding, "The thing with us is that we want to make sure it's the right timing, the right moment. We never want to force anything." Catch new episodes of Marvel’s Cloak & Dagger on Thursdays at 8 p.m. ET on Freeform.